Bwahahaha! Hilarious Beth. We had a pure white cat (Valerie) who tangled with a skunk. I called the vet and she said to wash Valerie in tomato juice to get rid of the smell. I did and it worked perfect except…. it left Valerie the same color pink as the sheep above. It took about 2 months for her color to fade back to white – meanwhile she would sit on the front step and give passers-bye an eye-full of a decidedly abnormal shade of cat. .
My sister dyed the white parts of her tuxedo cat green for Halloween, and then discovered the dye wasn’t going to come out without a lot more washing than the cat was going to let her get away with. The cat was still appreciably green-tinted come Valentine’s Day. And was not dyed for later holidays. Who’s in charge anyway? Someone will be out of a job by the end of the day if this isn’t cleared up. Can’t be all baaaaad, can it, Beth? Trying to get my goaaaaat, are you? Maybe this is the year we finally give the horned frog its due. i think that’s in the year 3000. The sheep look like they escaped from Little Bo Peep in “Tenth Kingdom” movie. I’m pretty sure that when Jesus said he would separate the sheep from the goats, he didn’t mean he didn’t want to wash them in the same load. 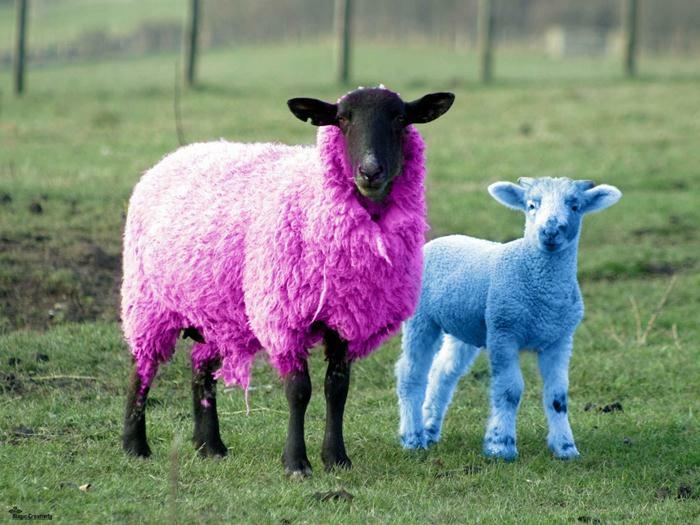 Dare I say a pair of dyed in the wool party going sheep? I wonder what the farmer has to say? and you too, andra. and get on it asap! You are so clever…(ah, so the Scotts do have a sense of humour!) fantastic! thanks, and it appears they do! Getting the animals into the act – cute one! Thank you. Yours is wonderful. Before I read the posting, my initial thought was boy sheep girl sheep. LOL! You have brought controversy and a cool picture together … I think it is a strong possibility that these two characters came out of an extended Mardi Gras celebration. Do you know yet which one it is? Year of the sheep, ram, or goat?